The Trump administration’s decision Monday to end temporary protections for Nicaraguans has put hundreds of thousands of other Central American immigrants on edge. Advocates urged all residents on temporary protected status to look at ways in which they might become permanent immigrants. “We’re calling all TPS holders from all 13 countries, as well as Dreamers, to continue to seek legal counsel, because they may qualify for an adjustment of status,” said Lariza Dugan-Cuadra of the Central American Resource Center, or CARECEN. Marriage or family ties may make some TPS recipients eligible for permanent residency, for example, and recent court decisions have made findings that could help simplify that path as well. But the decision to let temporary protected status for the 2,500 Nicaraguans around the nation expire in 14 months leaves beneficiaries from Central America and other qualifying countries with little information about what will happen to them. “This leaves 350,000-plus individuals and their families in limbo and is essentially continuing the sense of instability that the migrant community has to endure in this country today and has long endured,” she said. The decision by the Department of Homeland Security means that Nicaraguan immigrants nationwide who have temporary protected status will lose their legal immigrant status, possibly putting them at risk of deportation. They will not be allowed to work legally in the United States. Such protections are in place for immigrants of 13 nations, including 86,000 Honduras and 260,000 Salvadorans around the nation. With the loss of protected status, home and business owners could also face trouble securing or accessing their assets. In many states, drivers would lose their licenses. California allows undocumented drivers to obtain a drivers license, but it cannot be used as identification. Daniela Cardona, a recent San Francisco State University graduate in criminal justice, also helps out at the Centro Latino Cuscatlan in Emeryville. Both she and her mother, who owns an eco-conscious house-cleaning business, have protected status. Having just obtained a degree, Cardona said she’s concerned about getting a job without temporary status. “I’ve done all my schooling in the U.S., it would be such a waste,” she said. 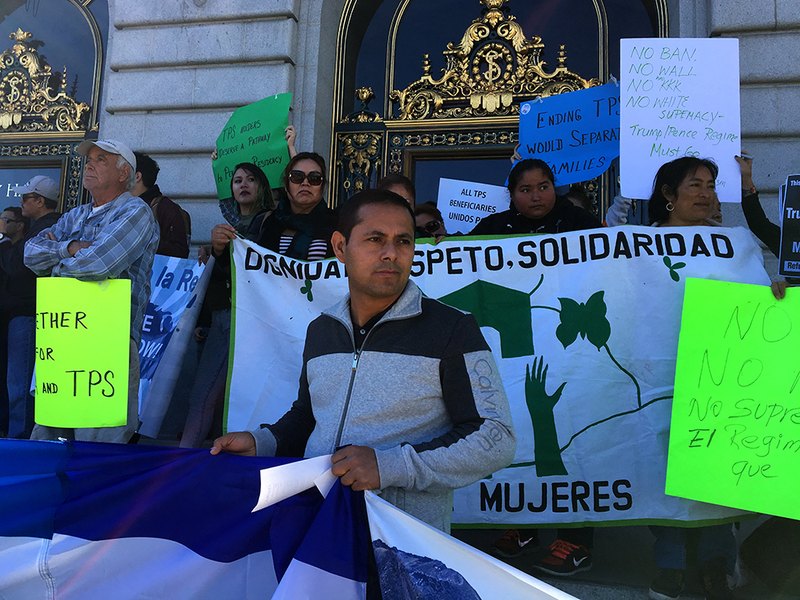 Edwin Carmona-Cruz of La Raza Centro Legal, a resource center in the Mission, said ending temporary protected status is counterproductive. He and other advocates also took aim at the hypocrisy of sending immigrants back to countries ravaged by armed civil conflicts that the United States was heavily involved in. “It’s important for us to really highlight where this comes from and … how we’re turning our backs on these communities that are one of the most vulnerable in our society,” Carmona-Cruz said. In spite of the uncertain future for program participants, Cardona, Carmona-Cruz and other immigrant advocates urged TPS beneficiaries to take every opportunity to have an accredited immigration adviser or lawyer look at their case for any opportunity to secure permanent residency. Immigration advocates and organizers will also host an informational presentation on immigration on Sunday, Nov. 12, at St. Anthony’s Church at 3250 Cesar Chavez St. from 2 to 4:30 p.m.